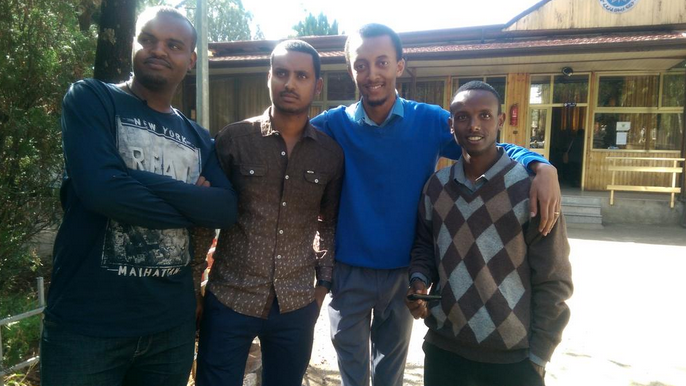 Zone 9 bloggers Abel Wabela, Atnaf Berahane, Natnael Feleke and Befeqadu Hailu. Photo by Mahlet Fantahun, shared on Twitter. Four members of the Zone9 blogging collective — Abel Wabela, Atnaf Berahane, Natnael Feleke and Befeqadu Hailu — appeared before the Supreme Court of Ethiopia on March 29, 2016 in the second instance of a case brought against them by the state. The bloggers, also Global Voices members, were originally arrested in April 2014, charged under the country’s Anti-Terrorism Act, and imprisoned for 18 months, until their October 2015 acquittal. State authorities have now succeeded in appealing the case, and the bloggers, though no longer in prison, are now once again facing the possibility of a long-term prison sentence. This week’s court date was brief and ended with a postponement to May 25, 2016. Between July 2014 and October 2015, the bloggers appeared before the court 39 times, only to be adjourned each time at the behest of the prosecution, which sought more time to investigate their case. They were never formally invited to testify before a jury. Since their acquittal and release from prison, the bloggers have reunited with their families, but have been largely unable to reintegrate themselves back into society. Their passports have been confiscated by authorities, making it impossible for them to leave the country, and their controversial political status has made it difficult for them to find work. After my release I basically do nothing, because I know that every move I make will be traced. I am afraid that I may go to prison….the appeal is like a chain to me right now. I am preparing myself for prison. Twenty people have been arrested and a Communist Party news site shuttered following the publication of a letter calling for the resignation of Chinese President Xi Jinping. New York-based activist Wen Yunchao tweeted out fears that authorities were holding his family captive over the publication of the letter on the news site Watching. Wen denies his involvement in the publication, noting he was pressured by authorities to make a confession. The dissident Chang Ping said his brothers were abducted by the authorities as well and that he has received similar pressure from the government. The letter criticizes Xi’s policies, arguing they have led to an “excessive” concentration of power in the stock and property markets. It appeared on the site for only a few hours. Watching has not published any original news since March 15, and staff members of the site have been asked to hand in their resignations. A new center intended to monitor and prevent “information attacks” will soon launch in Russia. In an interview with Vedemosti news outlet, co-founder and media mogul Igor Ashmanov defined information attacks as “propaganda campaigns, disinformation, fakes, and viral content.” Natalia Kasperskaya, co-founder of anti-virus giant Kaspersky Labs is the center’s other co-founder. Local media coverage of their plans suggests that a prime target for the center will be Russian social networks and blogosphere, where political debates and metaphorical “mud flinging” are the most active. It remains unclear how the center will interact with state cybercrime legislation and prevention efforts. The trial of seven Moroccan journalists and human rights defenders was postponed once again by a Rabat court. Five of those charged have been accused of “threatening the internal security of the State”, while two others face charges of “receiving foreign funding without notifying the General Secretariat of the government”. All had worked to hold the Moroccan government accountable for its human rights obligations. Among those charged is Hisham Almiraat, a medical doctor and leading voice in Morocco’s blogosphere, who is a long-time member of the Global Voices community. The trial, expected to begin this week, was postponed to June 29th. Supporters may follow the #Justice4Morocco hashtag on Twitter for updates. The US Federal Bureau of Investigation successfully unlocked an iPhone belonging to the prime suspect in a mass shooting in San Bernardino, California, with the help of an unnamed technologist. The FBI had asked Apple to disable certain security protections on the phone, but Apple refused, reasoning that this would jeopardize the security of its technologies. Although a court had ruled in Apple’s favor, this decision now feels somewhat unstable, as the FBI could now theoretically use this method to unlock iPhones in future investigations, without needing Apple’s assistance. [The FBI] has been given whatever vulnerability it used to get into the San Bernardino phone in secret, and it is keeping it secret. All of our iPhones remain vulnerable to this exploit. This includes the iPhones used by elected officials and federal workers and the phones used by people who protect our nation’s critical infrastructure and carry out other law enforcement duties, including lots of FBI agents. Schneier urges the FBI to immediately disclose the vulnerability to Apple, so that it may be fixed. He argues that in the long run, leaving such problems unsolved will do more damage to public security. The Internet Archive proposed a change to US copyright law that would render content accessible until it was proven to be protected under copyright, and striking a parallel with the principle in US law that a defendant is innocent until proven guilty. The change would allow content to remain online while disputes over who owns the rights to the content are settled. The US Copyright Office launched a public consultation late last year to assess the burdens of the current takedown process on copyright owners, online service providers, and the general public. The Archive also expressed concerns about proposals for a “notice and staydown” system that would prevent content taken down once from ever appearing again. Is the ‘Google tax’ making a coming back in EU? European Union lawmakers may revive the possibility of charging news aggregators like Google News under an ancillary copyright regime, also known as the “Google tax”. Publishers successfully passed similar laws in Germany and Spain, and German head of digital economy policy at the European Commission Gunther Oettinger is considering introducing the policy at the EU level. His department began a consultation that will run through June 15 asking whether earlier attempts at ancillary copyright had “any impact” on consumers, authors, publishers and web firms, according to Fortune.